Of the total sample analysed in the survey, it was found that 79.8 per cent of respondents said they joined the caravan seeking better quality of life. Another 45.7 per cent of respondents said they migrated due to insecurity or violence, while 2.9 per cent responded they were relocating for family reunification. 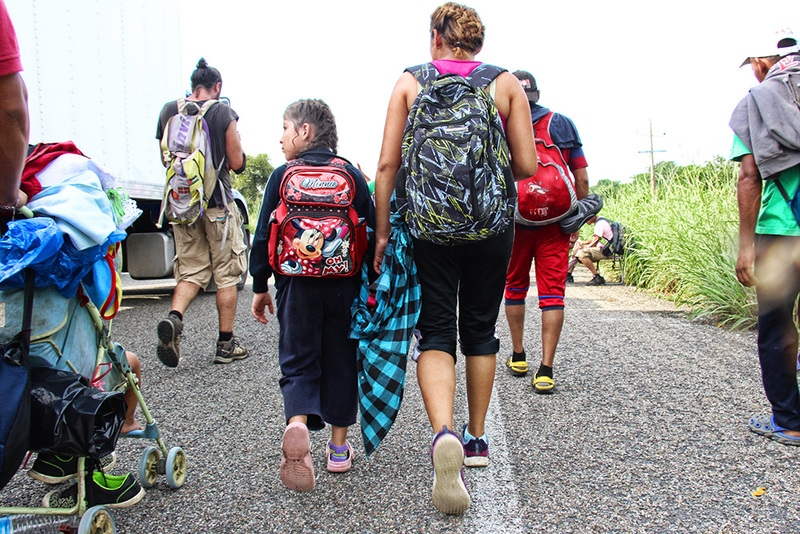 "These data indicate that the bulk of the people surveyed [cite] a multiplicity of reasons for migrating," said Jorge Peraza Breedy, IOM's Chief of Mission for El Salvador, Honduras and Guatemala. "In most cases, they refer two different causes as factors that drove the decision to mobilize, and in many cases, up to three." Some 60 per cent of those surveyed (286 people) came from the urban area. The study also determined that 83 per cent of individuals in this caravan, made up of approximately 1,700 people, are adults between 18 and 50 years old while 12 per cent are children and adolescents. The gender breakdown of this caravan is 80 per cent male, 20 per cent female. Also, 8 per cent of those who claimed to be the head of a travel group (a person leading a group of migrants travelling together) identified themselves as members of the LGBTI community. An estimated 1.7 per cent of the travel groups included a pregnant woman, while 5.2 per cent of these included a lactating woman. However, only 12.2 per cent of respondents stated that they knew about the mechanisms for requesting asylum, refuge or some other form of protection in their country of destination. "This situation highlights the need to strengthen communication of these issues," said Peraza. Other humanitarian needs detected through the survey were related to medications and treatments for chronic diseases. Eleven per cent of the people surveyed mentioned requiring some type of medicine and 8.8 per cent indicated that they had a severe or chronic illness. This information has been made available to different government entities and civil society actors, to facilitate the elaboration of action plans that offer comprehensive responses to the migrants in these flows. The survey did not include the collection of personal information, and for its preparation, the expressed and informed consent of the participant was requested before initiating the questionnaire, in strict adherence to the respect of human rights and to the IOM principles of data protection. The study was conducted with the methodology of the Displacement Tracking Matrix (DTM), which IOM has applied around the world in various crises. The DTM was developed by the Human Mobility Information Management Initiative in the Northern Triangle, with the support of the IOM Emergency Fund. Download the full survey results here.